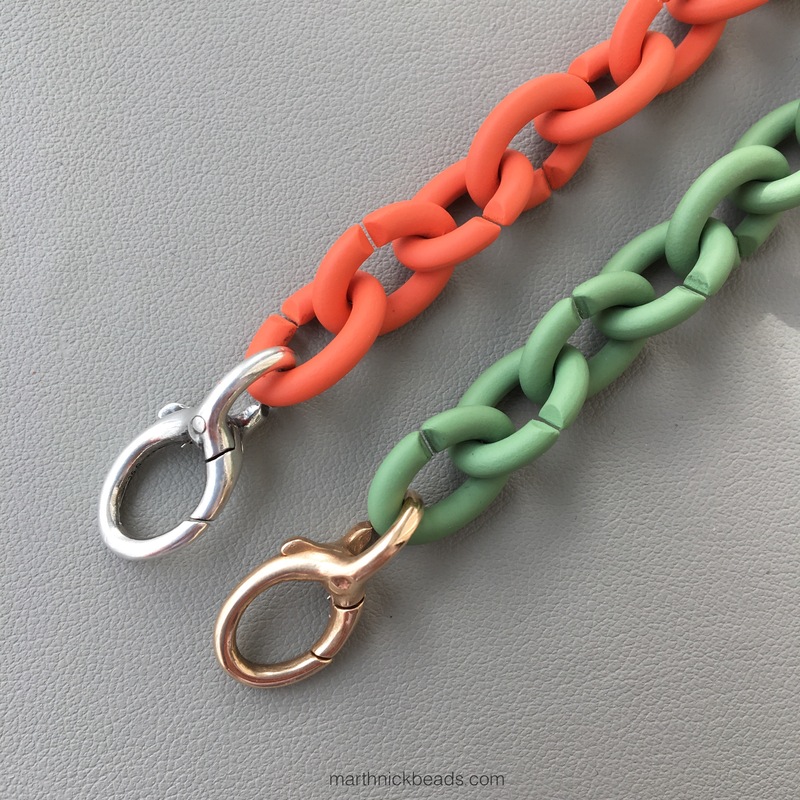 Today I’ve got some photos of the two new X Links colours, Soft Green and Soft Apricot. 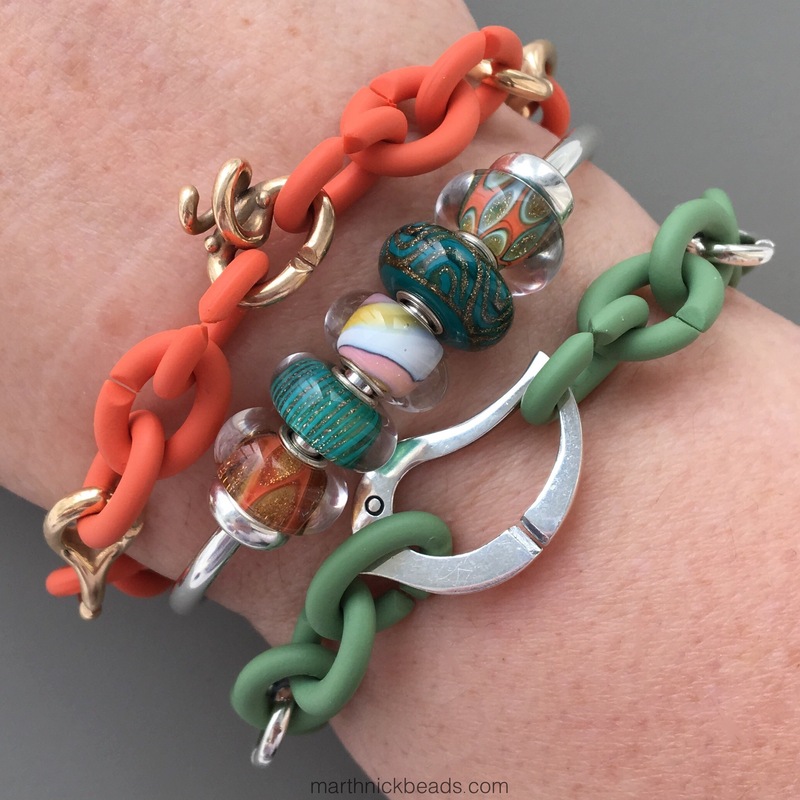 They came out as part of the Under the Palm Trees Spring Collection and it was interesting to see that the coloured rubber links were similar to the colours of the Enchanted Ways glass kit from the Trollbeads Kindred Spirits collection. 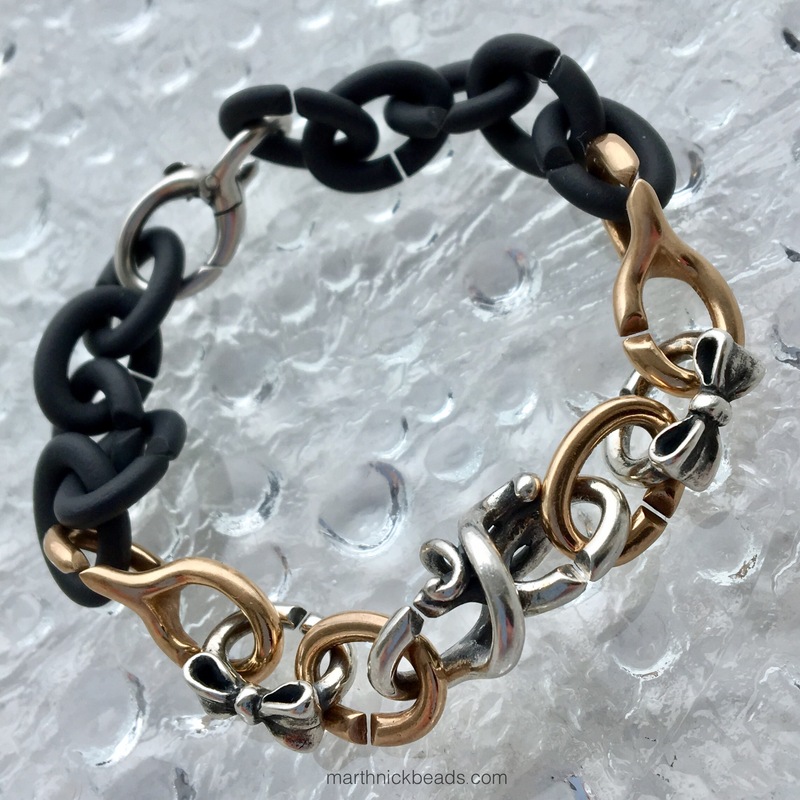 If you are not familiar with X Jewellery, it is a series of links, in silver, bronze and rubber. They link together and then you can add a lock. 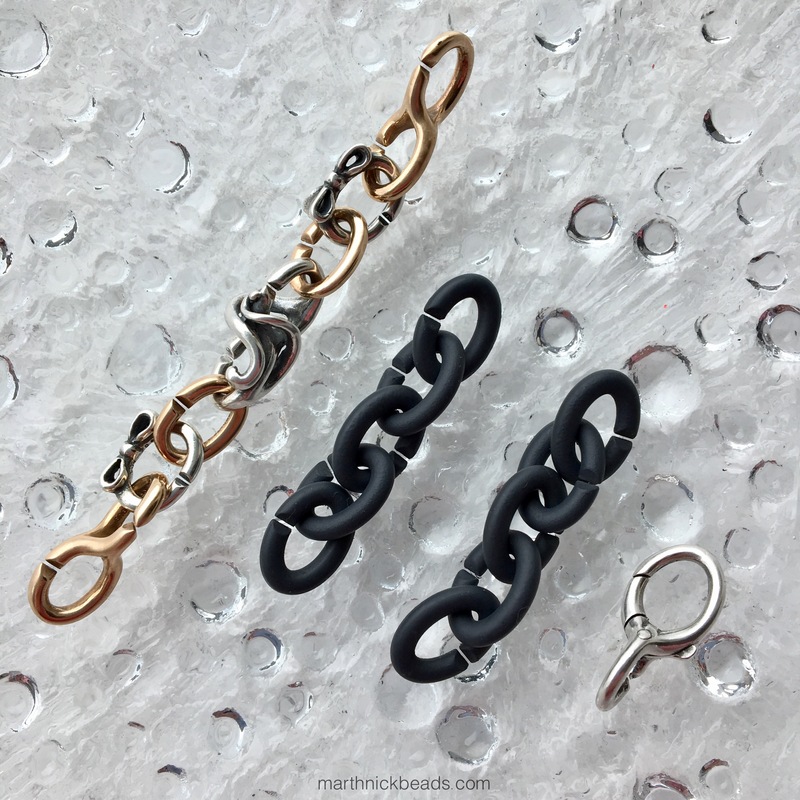 There are single and double links in bronze and silver. Some are plain and some are decorative. This one below is called Flow. 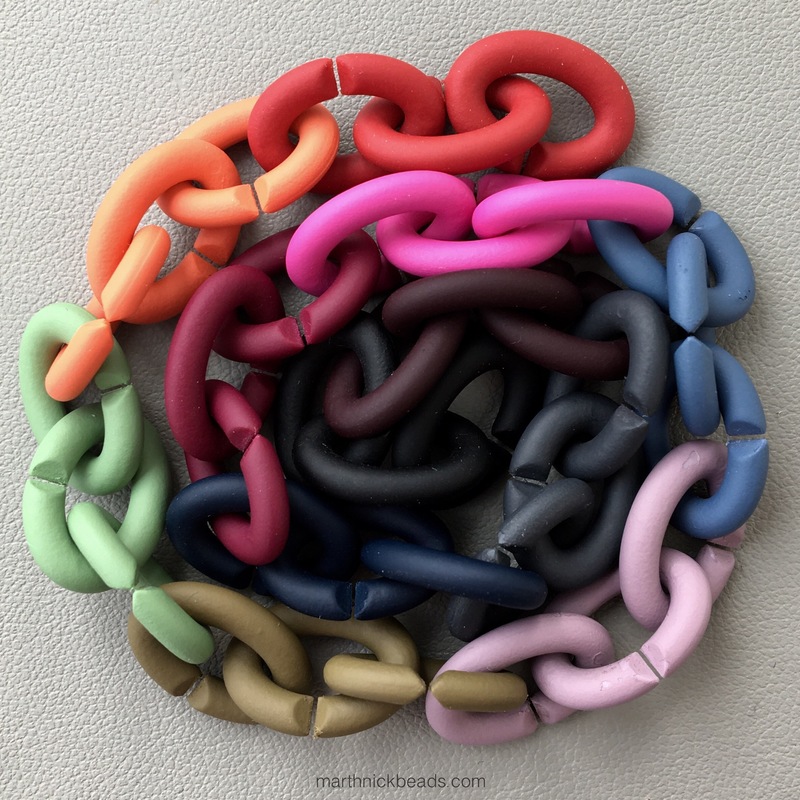 There are lots of colours to choose from and the rubber links are quite inexpensive. I have all the colours except for Mellow Yellow and Turquoise. The Soft Green looks really nice with the Mysterious Ways Kit. Here are the Pink ones with my new Blundstones! Next are a couple of photos of the two new colours with some beads from the Kindred Spirits collection. I think the Soft Apricot matches especially well. 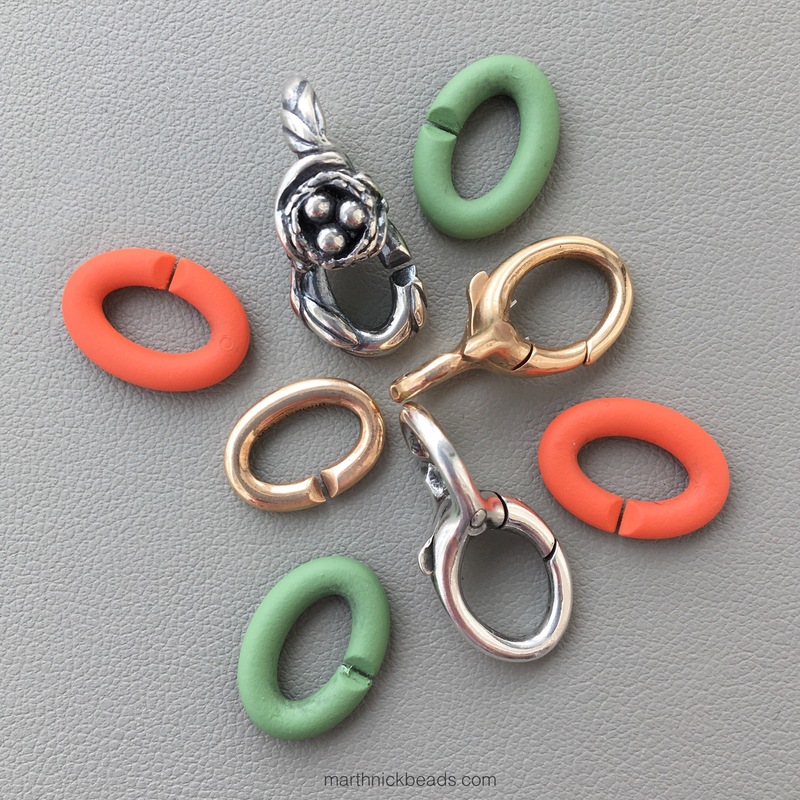 There are just so many ways to mix and match the X Links but I’ve been using the bronze with the Soft Apricot and silver with the Soft Green. I don’t change my X Jewellery around as much as I change beads. The other day though, I put some metal links together and for the next while will simply swap out sets of rubber links. If you have X Jewellery, how do you wear it? 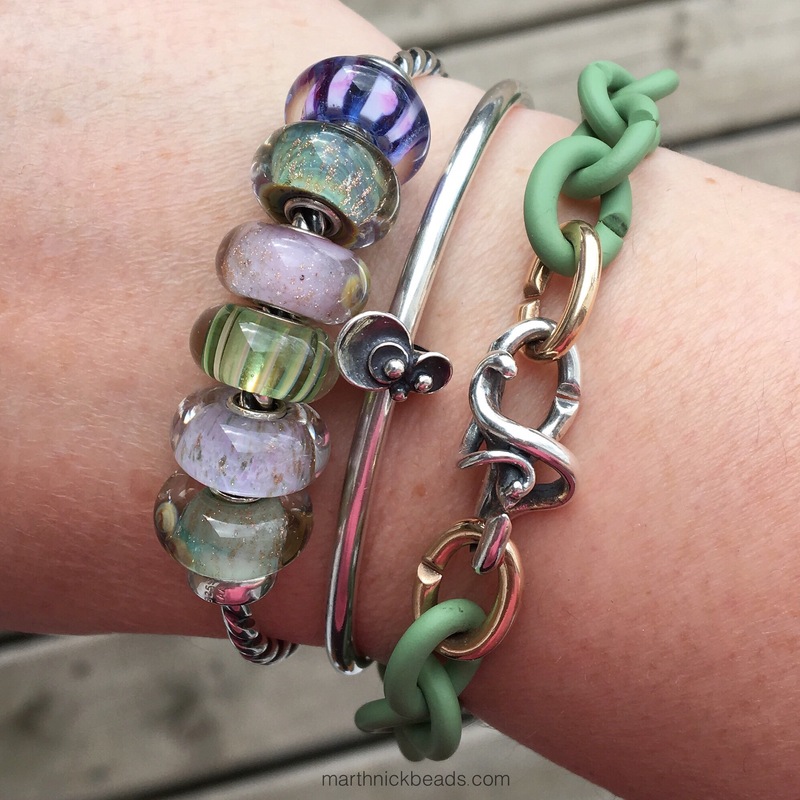 Do you keep bracelets made up or change things around? By the way, if you play the banjo the links do tend to get caught in the strings, but I bet no one reading this will have that problem, ha ha! P. S. The People’s Bead 2017 website is now live. Check it out here! Thanks for the photos! For X Jewellery, I have a set of rubber black links and steel blue links. As for metal, I have a silver lock and 2 double length silver links (the Snake and the Lover’s Bond.) I don’t have enough metal links to switch them up (they can be quite pricey so I purchased one from the Black Friday sale last year) so I swap between the rubber black links and steel blue links. I’m looking forward to the next big X Jewellery sale to pick up more metal links. Yes, the sales are definitely a great time to buy. I bought a Hallowe’en one at the Black Friday sale to use next year. Maybe I’ll combine the Soft Apricot and Black for that. 🤔I look forward to visiting the NYC store with you, April, as I imagine they carry the whole line there? Maybe I’ll pick up some Turquoise links. Yup, they have all of the regular collection pieces and some of the Retired links as well. Hi Martha! Thanks for the pictures! I have rubber links in black, steel blue, teal, pink and one of the reds but I don’t know which one. You have two different dark red/bordeaux rubber links in your pictures? Which are they? I tend to change my bracelets depending on my mood, the colour I’m wearing or the newest links I got and I want to wear so I rarely keep the same bracelets made up. Hi Alexandra! Yes, I often take the banjo in for substitute teaching jobs and can’t wear X Jewellery on those days, LOL. Ok, so the colour on the left, attached to the Pink is the Bordeaux. The one right below the Pink is actually the Brown, even though it looks like a burgundy or aubergine. 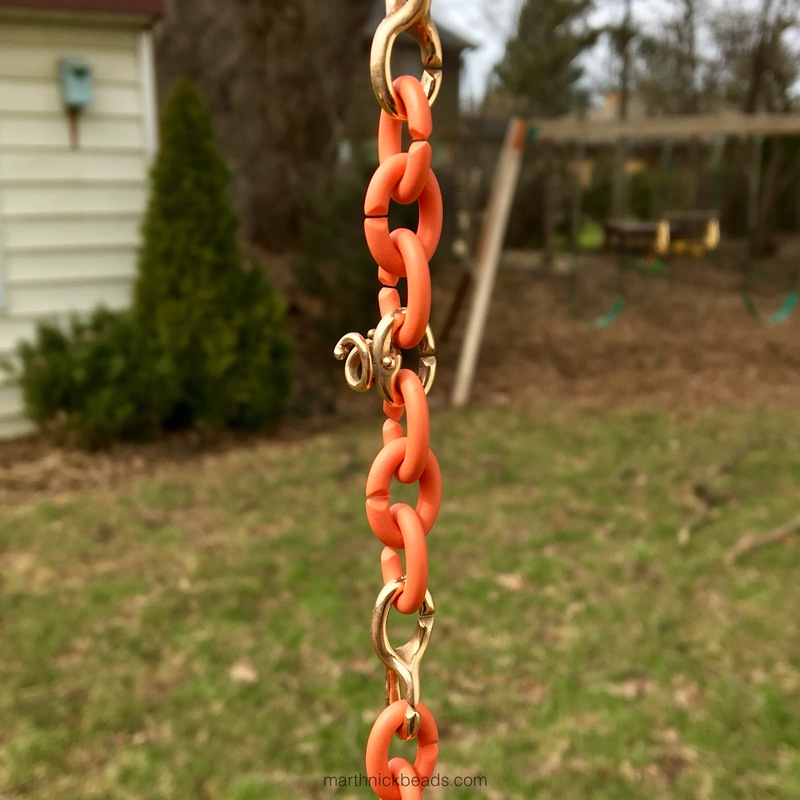 I’m enjoying hearing how people change their links…thanks for commenting! I have 3 double silver links (retired and half off) and 6 single silvers. I also have the Ying/Yang links but it’s kind of apart from the other. I just started collecting brass so I only have 3 single links (the star and two normal ones) and the lock. I have been somewhat on the fence about these. I like the colors but I’m not sure how I feel about the rubber pieces themselves. What I do like a lot is the silver links. That bird nest is wonderful and there are several others that I also really like. If I was going to do the rubber links it would only be a few of the soft apricot or the soft green ones but that’s just me. Looking at your bracelets is moving me closer toward getting them! Hi Suzanne! Yes, when these first came out people had strong feelings about them, either loving them or not! I have two friends who recently bought them, because of some great deals on sales. I really love the look of silver links and the Steel Blue together, which is like a navy blue. You’ll have to let me know if you do ever pick some up. They are truly comfortable to wear. Hi Martha, I’m making a wish list. Hi again Martha, I’m sorry I didn’t think to ask you if the silver ones are easy or difficult to connect to each other? I’m guessing the rubber ones would be okay but I wasn’t sure about the silver. Thanks. Hi Suzanne! The silver and bronze ones are a tad more fiddly than the rubber ones, but they all work pretty well together. You just have to be more precise with lining up the metal ones. Thanks for all the info on the links, Martha! I think they are quite interesting, but haven’t totally decided how I feel about them. What I love the most is how unique they are, as I’ve never seen anything quite like them, and the colors are fabulous. But as a total newbie, I just can’t get over the beads right now….. all I wanna do all day is look at beads! HahaHA! I’m new to X, and I love it! 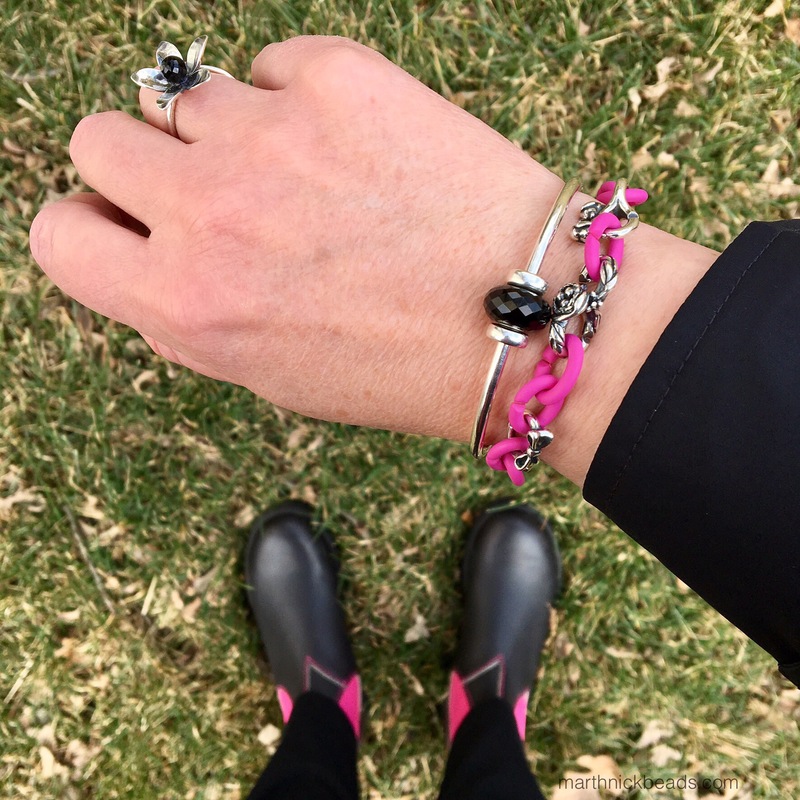 The bracelets are so light and easy to wear, and they make a very pretty counterpoint to a bead bracelet or bangle. I just have some violet and some silver links. 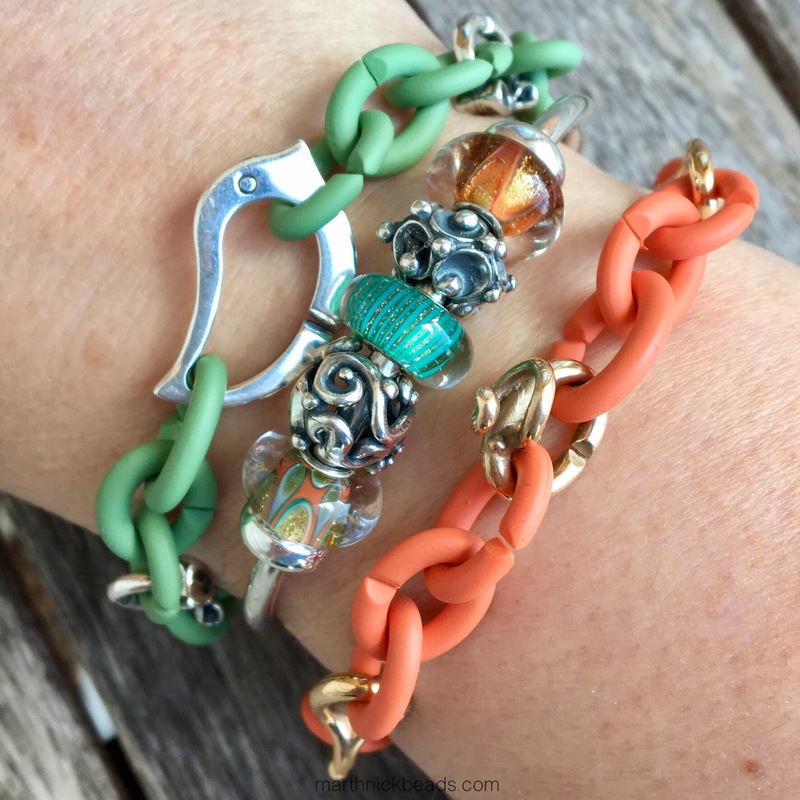 I would love the new soft green and soft apricot links – the colours are so fresh. I would like to try some bronze links, but I am not sure if they will tarnish as easily as copper does on me. It took me a long time to “come around” to X, but I’m glad I did! You make a good point that they are so light and easy to wear! For me the bronze tarnishes quickly on hot and humid days, but is fine the rest of the year. They shine up quickly in lemon juice though (not sure if you’re supposed to do that, but it works).